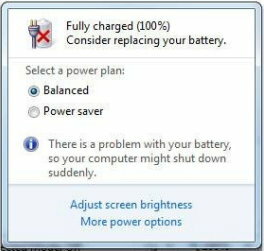 Does your new laptops battery with Windows 7 shows error “Consider Replacing your battery”? Don’t worry its windows problem and see why it is showing so and how you can solve it. Many of the laptop users I found with Windows 7, even their laptop is new, Windows showing error that battery is damaged and all and considering replacement. Most interesting point is that, battery is giving back up and all, but a small red cross keeps blinking on battery icon on system tray. In this Windows problem solving Tips, we’ll tell you how this error occurs and how to get rid of it. Why my Laptop shows Error Consider replacing your battery? You keep plug in and plug out the charger in between of the battery charging ad discharging process. You have recently installed drives/software that caused this error. How to fix Error Consider replacing your battery? There is no such quick solution besides updating your computers Windows, still you can opt any of the following solution to get rid of this error. After that select the all update, you can ignore the language relate updates and must to select the Windows important update. All this may vary according to size, Update and restart to install them and after 2 or 3 restart you should be get rid of that problem. Once you plugged in, charge the battery for 100% or at least 95% and unplugged the charger as soon as it reaches this limit. Now keep using your batter till less that 15% or 10% limit before next time plugging into power source. Keep using this criterion for 2 or 3 days; believe me you’ll get free from this error. 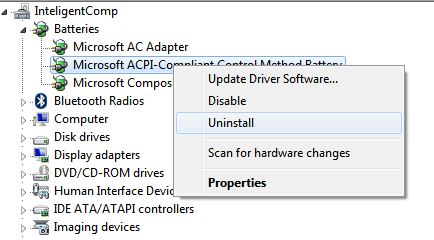 Hit Start menu>> Type Device manager >> Open it (May require Administrator permission) >> locate batter icon there and you’ll find Microsoft ACPI-Compliant control Method Battery >> Right click on it and Uninstall this one. After this Re-start your PC and keep using until 2 3 next restart. After this turn off the computer for at least 6-8 hour or don’t use the battery, like you can do it at night. After 1 or 2 day your problem will defiantly be solved. Look for the Support and Download >> Select your Model number >> See if there is any update for batter Firmware update. If available >> Download and install it carefully, don’t forget to read the manual supplied with it, otherwise your batter can be damaged completely. Hoping you’ll try those method, if anything you have to ask or share regarding this, let us know and comment below. there is another way how to fix that error, maybe your windows update setting is Never check for updates (not recommend), possible cause is your battery driver is up to date. to fix it update your battery drivers . how right click on computer manage->device manager>batteries>right click on Microsoft acpi-compliant control method battery->update driver..
what is the best solution ??? so what is the best solution that it doesn't damage my laptop. once you notice wear level goes around 50%, it will be working and warning will be removed. also you can install uninstall battry to check again.